Yes, I know that this album was released in 2003. However, recently, it’s been playing a lot while I’m at home so I figured I might as well write about it. 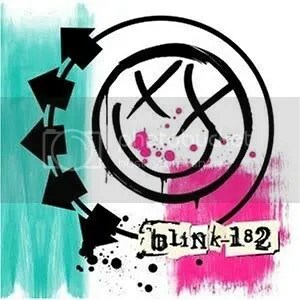 I don’t know what it is about Blink 182 that makes me like this album so much, but I love it. It might be that Travis Barker, whether you love him or hate him, is one of the best drummers in recent years. His drumming is intricate, adding a whole new layer to the music and fleshing out the sound for the trio. It might be that they have two different vocalists, Mark Hoppus and Tom DeLonge, who can alternate between sounding heartbroken, angry, giddy, and a wide range of other emotions. It might be that the simple lyrical content actually makes the songs stronger; they are easy to relate to and won’t make you scratch your head wondering what they really mean. You just listen and bob your head and hope that the energy in these songs is transferred to you by some sort of cosmic intervention. Or it might be that these three guys write some very catchy pop songs which I just can’t stop listening to. Yeah, that might be it. This entry was posted on November 15, 2009 at 12:00 pm and filed under TheSlacker. You can follow any responses to this entry through the RSS feed.